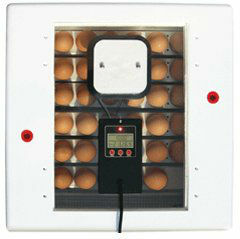 Digital display shows temperature, humidity, and days to hatch. New Incutek™ heater is fast and accurate - heating to factory pre-set temperature of 100 F within minutes. Days to hatch countdown - set at 21 days and is adjustable for a variety of eggs. Hi/Lo temperature alarm flashes when outside of range (<97° F or >103° F). Includes Fan Kit (Pulls in and circulates fresh air to stabilize temperature and improve hatch), Automatic Egg Turner (Eliminates manual handling and holds 41 eggs), and Egg Candler (Check the internal development process of the eggs). The Large Picture Window provides 360° unobstructed view inside incubator. Great for educational observation Additional probe thermometer included. Durable outer plastic shell protects the incubator and allows for easier cleaning. Deep Bottom Tray to accommodate even large duck & goose eggs. Eco-Friendly, made with recycled and insulating polystyrene foam.